Adults with epilepsy require structured annual review in primary care to discuss drug adherence, alcohol intake, lifestyle, and driving advice as well as assessment of potential comorbid depression and suicidality. 2 Seizure frequency and date of last seizure should be determined. Adults with well-controlled epilepsy frequently have no secondary care input and rely on primary care to meet these needs. Where seizures persist despite antiepileptic drug (AED) treatment, factors relating to poor control including incorrect diagnosis of epilepsy, inappropriate choice of AED for the epilepsy syndrome, and poor adherence to prescribed AEDs should be explored and referral to an epilepsy specialist considered. 2 This facilitates access to epilepsy specialist nurse support, and where required, access to tertiary care services. 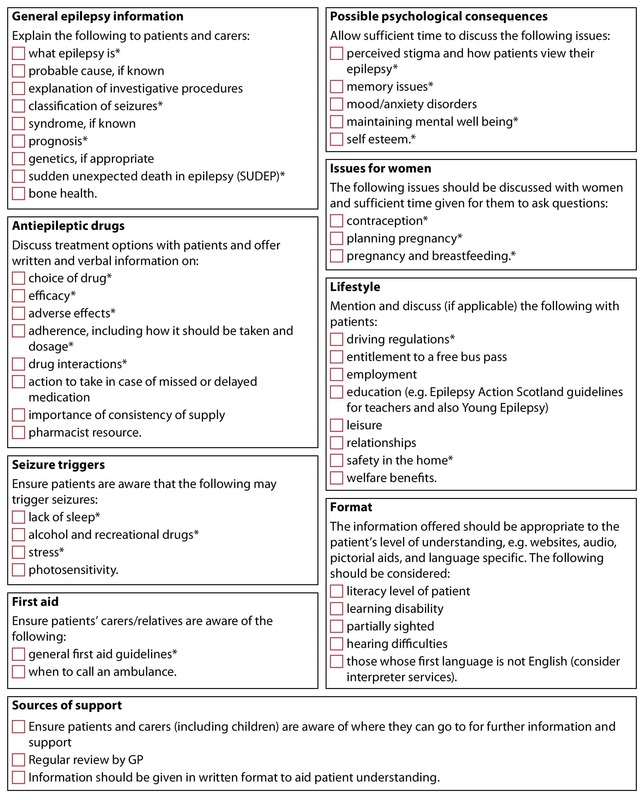 SIGN's updated guideline on Diagnosis and management of epilepsy in adults (SIGN 143, published in May 2015)2 reflects substantial changes in epilepsy management since the previous guideline, published in 2003. It covers all aspects of diagnosis and management, including a completely revised section on epilepsy and women's health and new sections on psychiatric comorbidity, sleep, and mortality (including SUDEP). The classification of epilepsy influences treatment choices, investigation, prognosis, and counselling. An updated classification and organisational system was proposed by the International League Against Epilepsy (ILAE) in 2010, although this is evolving and undergoing refinements. It is increasingly used in clinical practice, although has yet to be universally adopted. The terms 'simple partial seizure' and 'complex partial seizure' have been replaced by the term 'focal seizure'. Focal seizures in which consciousness is impaired are described as 'focal dyscognitive seizures'. focal epilepsies may present with focal motor activity, automatisms, déjà vu, and/or secondary generalised seizures. Patients with a suspected first seizure or new epilepsy should be advised not to drive until they have seen an epilepsy specialist. 5,6 They should be referred to a specialist in epilepsy and should be advised to take to their consultation an eyewitness (to the attack) or contact details of someone who witnessed the attack. 6 Anti-epileptic drugs (AEDs) should not be commenced in primary care without epilepsy specialist advice. focal onset seizures— lamotrigine is the drug of choice for focal onset seizures but if lamotrigine is poorly tolerated, carbamazepine and levetiracetam are other options. 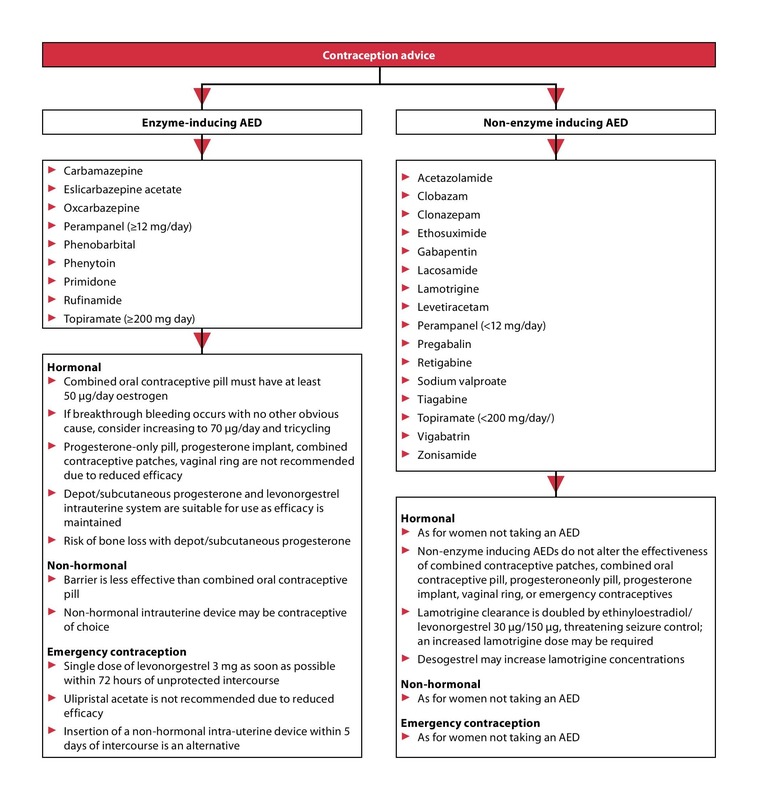 Drug-resistant epilepsy has been defined as failure to achieve sustained freedom from seizures after trials of two tolerated and appropriate AED schedules (whether as monotherapies or in combination).8 Many factors influence seizure control in patients with drug-resistant epilepsy. If a seizure or series of seizures lasts for more than 5 minutes, administer buccal or intranasal midazolam 10 mg as first-line rescue medication and give oxygen. If midazolam is not available, administer rectal diazepam 10 mg. Arrange emergency patient transfer to hospital by ambulance, to facilitate further intervention including securing airway and administration of intravenous benzodiazepines. Another study revealed that 61% of patients would prefer their care to be shared between primary and secondary services.1,10 A prospective audit to measure unmet clinical needs in 388 patients receiving treatment for epilepsy found that 48% of the 62 patients with poor seizure control were not receiving shared care.11 Specialist epilepsy nurses can facilitate shared care.9 The requirement for annual structured review in primary care is unchanged from SIGN 70, based upon a UK epilepsy needs document.12 People with epilepsy who are seizure-free on AEDs and discharged from hospital review continue to have significant healthcare needs and depend upon primary care review to have these needs met. Primary care professionals at all levels should be aware of the valuable contribution that can be made by epilepsy specialist nurses and by the voluntary sector (see Box 1, below). Advice on contraception should ideally be given to young women before they become sexually active; this is described extensively in section 5 of SIGN 143; see also Figure 2 (below). Women with epilepsy receiving lamotrigine can use progestogen-only contraceptives without restriction. A small study in women taking progestogen-only contraception reported a 20–100% increase in lamotrigine circulating concentrations in women receiving the AED with desogestrel.20 If these medications are prescribed together, women should be counselled about the possibility of symptoms of lamotrigine toxicity such as impaired balance, coordination, concentration, responsiveness or alertness, or symptoms of drowsiness or dizziness, or altered seizure control. Lamotrigine is not thought to affect the efficacy of combined hormonal contraceptives. 21 Women receiving lamotrigine may have their lamotrigine levels halved after introduction of COCP. 22 This may increase risk of seizures and healthcare professionals should warn patients of the potential for reduced efficacy of lamotrigine under these circumstances and its dosing may need to be altered if these two medications are used together.2 This effect is negated when lamotrigine is prescribed with sodium valproate, which inhibits lamotrigine glucuronidation.2 If combined hormonal contraceptives are withdrawn in women taking lamotrigine, toxicity due to rising levels of the latter may occur and women should be informed of signs and symptoms of lamotrigine toxicity2 which are listed above. Women who require emergency contraception while using an enzyme-inducing drug (or within 28 days of stopping enzyme-inducing drugs) should be advised that the copper intrauterine device (Cu-IUD) is the most effective method of emergency contraception and that it can also be used for ongoing contraception. Before a planned pregnancy, women of childbearing age with epilepsy benefit from a specialist services review of diagnosis and to improve seizure control, discuss adherence and SUDEP risk, rationalise AED therapy, and discuss folic acid supplementation and epilepsy inheritance concerns. Psychosis in people with epilepsy can present as a chronic condition or can be episodic, with direct relationship to seizures. Epilepsy commonly presents in the older population in the Western world. The annual incidence is 85.9 per 100,000 for people aged 65–69 years and 135 per 100,000 for those aged over 85 years. 38 Older people with epilepsy have a mortality rate 2–3 times higher than the general population.2 Patients with Alzheimer's disease are up to ten times more likely to develop epilepsy than those without the condition.39,40 Stroke can account for up to 50% of cases where a cause can be identified, and the risk of epilepsy increases up to 20-fold in the first year after a stroke.39 If there are coexistent cognitive problems, an epilepsy care plan should be considered. People with epilepsy continue to have a wide range of unmet needs in both primary and secondary care. In primary care, structured face-to-face annual review is recommended in SIGN 143 to highlight and address some of these needs. Reduction in mortality can be achieved by improvements in seizure control using a variety of means, including appropriate driving advice, encouraging improved medications adherence, early identification of suicidal ideation, and by enabling shared care for those patients with poor seizure control. For a tonic-clonic seizure or series of seizures that last 5 minutes or longer, midazolam 10 mg given buccally or intranasally is first-line rescue medication. Local drug formularies should include special sections on the complexities of prescribing contraception to women with epilepsy; these patients might benefit from contraceptive and sexual health (CASH) clinic support. Royal College of Physicians of Edinburgh.Consensus conference on better care for children and adults with epilepsy: Final consensus statement. Edinburgh: The College, 2002. Berg A, Berkovic S, Brodie M et al. Revised terminology and concepts for organization of seizures and epilepsies: report of the ILAE Commissionon Classification and Terminology, 2005–2009. Epilepsia 2010; 51 (4): 676–685. Driver and Vehicle Licensing Agency. At a glance guide to the current medical standards of fitness to drive. Swansea: DVLA, 2014. Available at: www.gov.uk/government/uploads/system/uploads/attachment_data/ file/390134/aagv1.pdf. Yamada M, Welty T. Generic substitution of antiepileptic drugs: a systematic review of prospective and retrospective studies. Ann Pharmacother 2011; 45 (11): 1406–1415. Kwan P, Arzimanoglou A, Berg A, et al. Definition of drug resistant epilepsy: consensus proposal by the ad hoc Task Force of the ILAE Commission on Therapeutic Strategies. Epilepsia 2010; 51 (6): 1069–1077. Poole K, Moran N, Bell G et al. Patients' perspectives on services for epilepsy: a survey of patient satisfaction, preferences and information provision in 2394 people with epilepsy. Seizure 2000; 9 (8): 551–558. Chappell B, Smithson W. Patient views on primary care services for epilepsy and areas where additional professional knowledge would be welcome. Seizure 1998; 7 (6): 447–457. Minshall I, Smith D. Unmet needs in patients with epilepsy, following audit, educational intervention and the introduction of the New General Practice Contract. Prim Health Care Res Dev 2012; 13 (1): 85–91. Brown S, Betts T, Crawford P et al. Epilepsy needs revisited: a revised epilepsy needs document for the UK. Seizure 1998; 7 (6): 435–446. Carbone L, Johnson K, Robbins J et al. Antiepileptic drug use, falls, fractures, and BMD in postmenopausal women: findings from the women's health initiative (WHI).J Bone Miner Res 2010; 25 (4): 873–881. Jetté N, Lix L, Metge C et al. Association of antiepileptic drugs with nontraumatic fractures: a population-based analysis. ArchNeurol 2011; 68 (1): 107–112. Shiek Ahmad B, Hill K, O'Brien T et al. Falls and fractures in patients chronically treated with antiepileptic drugs. Neurology 2012; 79 (2): 145–151. Lee R, Lyles K, Colón-Emeric C. A review of the effect of anticonvulsant medications on bone mineral density and fracture risk. Am JGeriatr Pharmacother 2010; 8 (1): 34–46. Betts T, Fox C. Proactive pre-conception counselling for women with epilepsy—is it effective? Seizure 1999; 8 (6): 322–327. Schwenkhagen A, Stodieck S. Interaction between Lamotrigine and a progestin-only contraceptive pill containing desogestrel 75mg (Cerazette). Epilepsia 2004; 45: 144. Sidhu J, Job S, Singh S, Philipson R. The pharmacokinetic and pharmacodynamic consequences of the co-administration of lamotrigine and a combined oral contraceptive in healthy female subjects. Br J Clin Pharmacol 2006; 61 (2): 191–199. Gaffield ME, Culwell KR, Lee CR. The use of hormonal contraception among women taking anticonvulsant therapy. Contraception 2011; 83 (1): 16–29. Battino D, Tomson T, Bonizzoni E et al. Seizure control and treatment changes in pregnancy: observations from the EURAP epilepsy pregnancy registry. Epilepsia 2013; 54 (9): 1621–1627. Harden C, Hopp J, Ting T et al. Practice parameter update: management issues for women with epilepsy—focus on pregnancy (an evidence-based review): obstetrical complications and change in seizure frequency. Report of the Quality Standards Subcommittee and Therapeutics and Technology Assessment Subcommittee of the American Academy of Neurology and American Epilepsy Society.Neurology 2009; 73 (2): 126–132. Fairgrieve S, Jackson M, Jonas P et al. Population based, prospective study of the care of women with epilepsy in pregnancy. BMJ 2000; 321 (7262): 674–675. Crawford P. Best practice guidelines for the management of women with epilepsy. Epilepsia 2005; 46 (Suppl. 9): 117–124. Czeizel A, Dudás I. Prevention of the first occurrence of neural-tube defects by periconceptional vitamin supplementation. NEngl J Med 1992; 327 (26):1832–1835. Rasmussen S, Chu S, Kim S et al. Maternal obesity and risk of neural tube defects: a metaanalysis. Am J Obstet Gynecol 2008; 198 (6): 611–619. Gandy M, Sharpe L, Nicholson Perry K et al. Assessing the efficacy of 2 screening measures for depression in people with epilepsy.Neurology 2012; 79 (4): 371–375. Christensen J, Vestergaard M, Mortensen P et al. Epilepsy and risk of suicide: a population-based case–control study. Lancet Neurol 2007;6 (8): 693–698. Piedad J, Rickards H, Besag F, Cavanna A. Beneficial and adverse psychotropic effects of antiepileptic drugs in patients with epilepsy: a summary of prevalence, underlying mechanisms and data limitations. CNS Drugs 2012; 26 (4): 319–335. Sillanpaa M. Epilepsy in the mentally retarded. In: Wallace S, editor. Epilepsy in children. London: Chapman and Hall Medical 1996; 417–427. Hannah J, Brodie M. Epilepsy and learning disabilities—a challenge for the next millennium? Seizure 1998; 7 (1): 3–13. Coulter D. Comprehensive management of epilepsy in persons with mental retardation.Epilepsia 1997; 38: S24–S31. Wallace H, Shorvon S, Tallis R. Age-specific incidence and prevalence rates of treated epilepsy in an unselected population of 2,052,922 and age-specific fertility rates of women with epilepsy. Lancet 1998; 352 (9145): 1970–1973. Brodie MJ, Elder AT, Kwan P. Epilepsy in later life. Lancet Neurol 2009; 8 (11): 1019–1030. Irizarry MC, Jin S, He F, Emond JA, Raman R, Thomas RG, et al. Incidence of new-onset seizures in mild to moderate Alzheimer disease.Arch Neurol 2012; 69 (3) 368–372. Cockerell O, Johnson A, Sander J et al. Mortality from epilepsy: results from a prospective population-based study. Lancet 1994; 344 (8927): 918–921. Lhatoo S, Johnson A, Goodridge D et al. Mortality in epilepsy in the first 11 to 14 years after diagnosis: multivariate analysis of a longterm, prospective, population-based cohort.Ann Neurol 2001; 49 (3): 336–344. Neligan A, Bell G, Johnson A et al. The longterm risk of premature mortality in people with epilepsy. Brain 2011; 134 (Pt 2): 388–395. Fazel S, Wolf A, Långström N et al. Premature mortality in epilepsy and the role of psychiatric comorbidity: a total population study. Lancet 2013; 382 (9905): 1646–1654. Nashef L. Sudden unexpected death in epilepsy: terminology and definitions. Epilepsia 1997; 38 (11 Suppl): S6–S8. Tomson T, Nashef L, Ryvlin P. Sudden unexpected death in epilepsy: current knowledge and future directions. Lancet Neurol 2008; 7 (11): 1021–1031. Langan Y, Nashef L, Sander J. Case-control study of SUDEP. Neurology 2005; 64 (7): 1131–1133. Nilsson L, Farahmand BY, Persson PG, Thiblin I, Tomson T. Risk factors for sudden unexpected death in epilepsy: a case-control study. Lancet 1999; 353 (9156): 888–893. Walczak TS, Leppik IE, D'Amelio M, Rarick J, So E, Ahman P, et al. Incidence and risk factors in sudden unexpected death in epilepsy: a prospective cohort study. Neurology 2001; 56 (4): 519–525. Mohanraj R, Norrie J, Stephen L. Mortality in adults with newly diagnosed and chronic epilepsy: a retrospective comparative study. Lancet Neurol 2006; 5 (6): 481–487. Hesdorffer D, Tomson T, Benn E et al. Do antiepileptic drugs or generalized tonic-clonic seizure frequency increase SUDEP risk? A combined analysis. Epilepsia 2012; 53 (2): 249–252.